Organize a speaking event with US Campaign member group Middle East Children's Alliance! 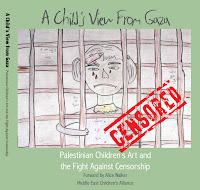 Executive Director Barbara Lubin and Associate Director Ziad Abbas are organizing a book tour for MECA's recently released book, "A Child's View from Gaza: Palestinian Children's Art and Fight against Censorship." Three years ago, I traveled to Gaza to deliver more than six tons of food, medicine, and medical supplies--including a new ambulance--following Israel's attacks, which killed more than 1400 people, including 352 children. I can still see the look of sheer terror and trauma on the faces of the children. Right after the attacks, MECA helped our Gaza partners launch "Let the Children Play and Heal," a program that gives children psychological support and an opportunity to express themselves through art, dance, music, and story-telling. Many children drew pictures of the devastation they witnessed, which comprise the now famous exhibit, "A Child's View from Gaza." We found a place to show the children’s art after it was censored by the Museum of Children's Art in Oakland last fall. And we will continue to fight back against censorship and the bullying of anti-Palestinian groups that silence Palestinian voices. Recently, we published high-resolution, print images of the children's drawings in a book--which undoubtedly serves as part of the historical record of horror inflicted on the Palestinian people--so that the children's stories will reach an even broader audience. Ziad or I would be pleased to come to your community to share the children’s art, the fight against censorship, the lives of Palestinian children, and MECA’s work to meet their basic needs. Click here to let us know if you’re interested and we’ll get in touch soon.